The AirFit P10 For Her Nasal Pillow Mask with Headgear provides comfort and simplicity in a lightweight design. The QuietAir™ woven-mesh vents offer diffused exhalation making for an extremely quiet experience. 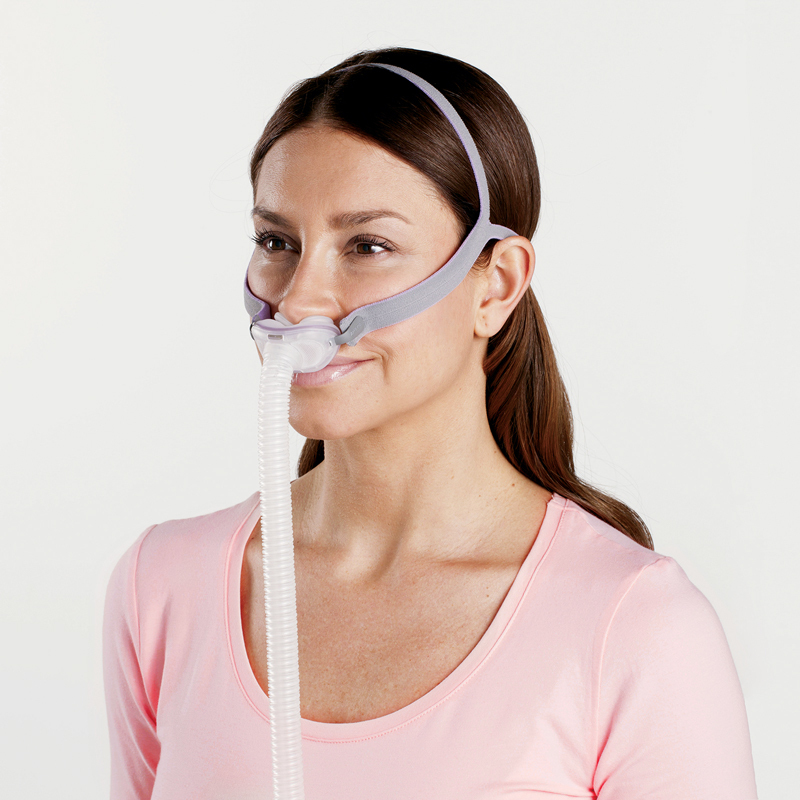 The ResMed AirFit™ P10 For Her Nasal Pillow CPAP Mask with Headgear is both quiet and lightweight. It builds on the success found in the Swift™ FX nasal pillow design. This is a nasal pillow mask with the nasal pillows sealing directly against the opening of the nose. ResMed took a fresh and quiet approach to venting exhalation with QuietAir™. The unique woven-mesh defuses the exhaled air to reduce disturbance to the user or bed partner. 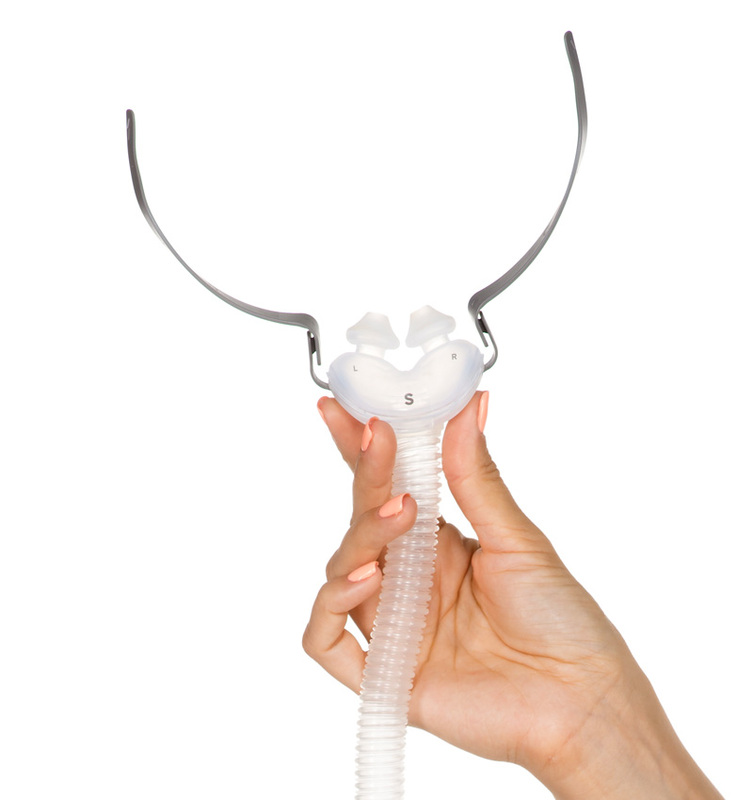 The AirFit™ is 50% quieter than the ResMed Swift FX. The proven seal and reliability featured in the Swift™ FX is found in the AirFit™. The dual wall design supports the seal of the nasal pillow against the opening of the nose. The pillow easily snaps onto the mask frame after cleaning. The AirFit™ For Her includes three color-coded pillow sizes - Extra Small (pink), Small (clear) and Medium (gray). Pillow orientation is clearly marked with the size indicator and "R" / "L" stamped on the bottom of each nasal pillow set. Additionally, the pillow frame has embossed or raised letter saying RESMED along the top of the frame to help in correct fitting in a darkened room. See the Important Tips Tab of this product page for more information about orienting the AirFit™ P10. ResMed designed the QuickFit™ Headgear in a two toned elastic fabric requiring no fasteners or clips. It features a split strap allowing the user to easily adjust the fit. Spreading the lower and upper strap apart loosens the fit and moving them closer together provides a tighter fit. The gray side of the headgear is worn facing out, with the pink side facing in. The AirFit™ stabilizer frame slides into the button hole on the gray side of the headgear. The AirFit™ improves on the Swift FX Nasal Pillow mask with a quiet and lightweight design with minimal facial contact. It is made up of 3 parts which are easily cleaned and reassembled. The AirFit™ weighs just 1.6 ounces, 50% less than ResMed Swift FX. The AirFit™ flexi-tube allows for ease of movement during sleep without disrupting the nasal pillow seal. The lightweight hose is designed to avoid drag on the mask and limits seal disruption. The flexi-tube is permanently attached to the AriQuiet™ vent assembly. Total hose length, including swivel, is 17 inches. ResMed offers a feminine touch for the AirFit™ For Her with the QuickFit™ dusky pink elastic headgear. The included nasal pillows sizes of Extra Small, Small and Medium meet the needs of a smaller facial structure. Worst mask. Fells like air vents are stopped up and you can not get enough air. I have tried several masks..I love this one! Its quiet..comfortable and very light. I really like the pillows themselves: the vents diffuse the exhale so that there is really no air stream. What's wrong is the headgear. Within less than two weeks it becomes so stretchy that it doesn't hold the seal. That said, I've come up with a fix of sorts: I twist the straps. This fix is semi-successful. I have been reasonably happy with the Swift FX except for the *&%^%# air stream with the exhale. I am going to try to Pilairo: the head gear appears to be sensible unlike the headgear on the AirFit. Because of the headgear, I'm awarding this three (3) stars. If it had effective headgear, I'd happily score it as a five-star item. I love this new mask. The pillows seal snugly and the elastic strap fits just right, not to tight, not to loose. The strap does move once in a while, but all mask with straps have a tendency to move. The quietness of this mask is awesome. My husband cannot believe how quiet it is. We both have CPAP's, once he tried my mask on he has decided that this will be the next mask that he gets.